Everyone recognizes red clover for it’s beautiful purple flower. Red clover (trifolium pratense) also has other common names such as trefoil, cow grass, cleaver grass and purple clover. It is a perennial herb that grows to about 16 inches. It has a hairy upright stem. The leaves have 3 (sometimes 4) oval leaflets with a white crescent mark on them. The flowers can range from pink to dark purple. 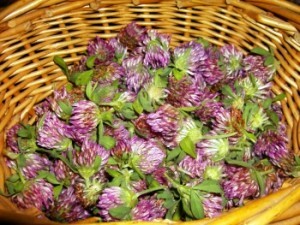 Red Clover is a common wayside plant, but it is also cultivated as a fodder crop for cows, and other grazing animals. It is also grown for hay and used in gardens as a nitrogen additive for crops. Copyright © 2000 - 2019 Cloverleaf Farm. All Rights Reserved.